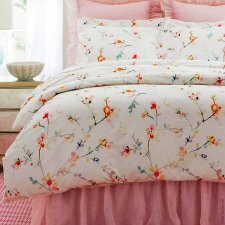 Yves Delorme's Flora bed linens are 100% long-staple combed cotton percale, with a braided piping finish. The elaborate Flora printed design evokes a garden from the far ends of the globe where the richness of the flora shelters birds and dragonflies. Shown with Athena. 55 x 79 x 18 in. 63 x 81 x 18 in. 79 x 81 x 18 in. 75 x 85 x 18 in.